View along Franklin Avenue, Los Angeles, California. Franklin Avenue is a street in Los Angeles. It is the northernmost thoroughfare in Hollywood, north of Hollywood Boulevard, and the southern border of the Hollywood Hills. It is the center of the stylish neighborhood of Franklin Village. Franklin Avenue begins as a residential street off Sierra Bonita Avenue. Continuing East, Franklin is the southern border of Whitley Heights and turns into a major east–west thoroughfare in the Hollywood Hills. It ends in Los Feliz. Listing landmarks from west to east on Franklin, The Magic Castle is furthest west. The first house in the Hollywood area, built by Tomás Urquidez in 1854, was at the intersection of what would become Franklin Avenue and Outpost Drive. The corner of Franklin and Gower Street is cited as one of the better places to photograph the Hollywood Sign. The Château Élysée, a former residential apartment house for movie stars (now the Church of Scientology Celebrity Centre) is located in the Franklin Village neighborhood, as is The Upright Citizens Brigade Theatre. 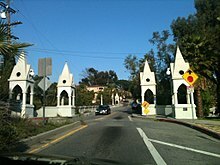 The Shakespeare Bridge is located further east near the intersection of Franklin with St. George Street in the Franklin Hills area of the Los Feliz district of Los Angeles. ^ Ziegler, Curt. "Franklin Village". Take Sunset real estate, architecture, and things to do in los angeles. Take Sunset. Retrieved 8 May 2015. ^ Robert White; Phyllis White (March 2002). Hollywood & the Best of Los Angeles Alive!. Hunter Publishing, Inc. p. 112. ISBN 978-1-58843-286-5. Retrieved 27 August 2012. ^ Gregory Paul Williams (30 September 2006). The Story of Hollywood: An Illustrated History. p. 7. ISBN 978-0-9776299-0-9. Retrieved 27 August 2012. ^ "Viewing the Hollywood Sign". LA Tourist. LAtourist.com, LLC. Retrieved 14 April 2015. ^ Ruth Wallach; Linda McCann; Dace Taube; Claude Zachary; Curtis C. Roseman (22 October 2008). Historic Hotels of Los Angeles and Hollywood. Arcadia Publishing. p. 118. ISBN 978-0-7385-5906-3. Retrieved 27 August 2012. ^ Jeff Dickey (1 October 2003). Rough Guide to Los Angeles. Rough Guides. p. 91. ISBN 978-1-84353-058-9. Retrieved 27 August 2012.